“It was a great and exciting meeting because I saw Brad Pitt and Ricky Martin.” After a few interactions with my classmates and friends at Dickinson, I discovered how to describe my trip to New York at the Clinton Global Initiative (CGI) Conference. Apparently no one has interest in hearing that I came from a conference where world leaders came from across the world, no matter what political affiliations they have, no matter what religious beliefs they have and even no matter what languages they were speaking. They came together to commit to bringing changes in human life, like seeking solutions for climate change, eliminating human trafficking, alleviating poverty and making education accessible. The Fifth Annual Clinton Initiative started on Sept. 22 and continued until Sept. 25. Every year at this time the CGI brings famous non-government organizations (NGOs), world leaders, business leaders and individual human rights activists to discuss some serious issues that exist today. On the third day, in a special plenary, members talked mainly about access to education, jobs and health care. Due to a statistic that shows that almost 180 million children work instead of attending school, this year the CGI members made several commitments to create jobs and access to education, especially for children. In the plenary, which was moderated by The New York Times columnist Nicholas D. Kristof, the panelists talked about universal education, its quality and the role of youth in the modern world. In particular, the Queen of Jordan, Rania Abdulla, stressed the importance of children’s education on the primary level. She compared the $11 billion cost of sending all children to primary school, the same amount of money that Americans spend on pets in three months and that Europeans spend on ice cream in a year. This amount is equivalent to 10 percent of NATO’s military budget. Carlos Slim, a Mexican businessman and philanthropist, was also there. Kristof asked him a question regarding poverty. Kristof pointed to his recent interview with The New York Times in which he said the long term solution for poverty is jobs, and asked if this can be possible in developing country where there are no jobs and children are facing miserable limitations. Kristof gave him an example that he heard from a Kenyan girl who asked if she should continue to sleep with a man who is paying her school fees: should she continue the risk of getting AIDS or should she drop out of the school? This remains a nightmare situation for the girl, an example of thousands. Slim said that education is important today and that it should happen in early childhood. Once again he emphasized that there is no way out of poverty but education. The panelists talked more on other important issues, such as youth’s education and increasing the quality of education in developing world. According to the United Nations, 161 countries out of 192 are involved with human trafficking. Only in 2007, 27 million people were smuggled around the world for different forms of exploitation like slavery, commercial labor and sexual purposes. Children comprise 50 percent of human trafficking and mostly they are aged of 12 to 14 and most likely they are subjected to sexual exploitation. In a separate session about strengthening infrastructure, Kofi Anan, the former Secretary General of the United Nations, emphasized that we not only need physical infrastructure but also soft infrastructure like education, global economy and exchanging global ideas. One of the most interesting sessions was on human dignity. Wangari Muta Maathai, founder of The Green Belt Movement in Kenya and Noble Prize winner, stressed that dignity comes from giving women opportunities to work, giving education to children and having a land on which they can build their houses. This year there was a special focus on women as a vulnerable body of the society; they are disproportionately affected by poverty. According to statistics released at the meeting, more than 1.4 billon people live in extreme poverty, on $1.25 a day or less, and the vast majority of them are women. At the Clinton Global Initiative, many well-known people, including Hollywood actors and actresses and singers, participated. Ricky Martin also took opportunity to raise awareness of human trafficking. Through his organization, the Ricky Martin Foundation, he advocates for children's rights and combats human trafficking. Shortly after Ricky Martin, Brad Pitt took to the podium to discuss rebuilding New Orleans. Pitt started a foundation in 2007 that focuses on home construction in a section of New Orleans that was heavily damaged when Hurricane Katrina struck in Aug. 2005. The fourth and final day, the closing plenary featured the progress achieved over the past five years. Former President Bill Clinton and Secretary of State Hillary Clinton closed the meeting. 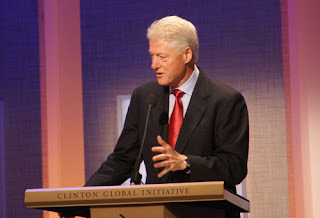 Former President Clinton announced that CGI members at the conference in 2009 have made 284 new commitments, valued at more than $9.4 billion dollars. In total, these commitments are projected to improve more than 200 million lives. Since 2005, members of the Clinton Global Initiative have made nearly 1,700 commitments valued at $57 billion dollars. Eighty million people will generate sustainable income through self-employment or new job opportunities through these commitments. At the end of the day when the conference ended, I walked out from the Sheraton New York Hotel & Towers, and as I was walking in the crowd of multi-ethnic people, many questions rushed into my mind but of one them stuck: How we can bring changes in our own community as individuals?